Internet Your Way to a New Job provides you with what you need to know on how to build your career and find a new job. "Alison Doyle's instructions are timely, easy to follow and certainly provide a great resource for today's job seeker. It should be a must-read for anyone who's currently on a job search, or is contemplating one in the near future. It's a great investment." 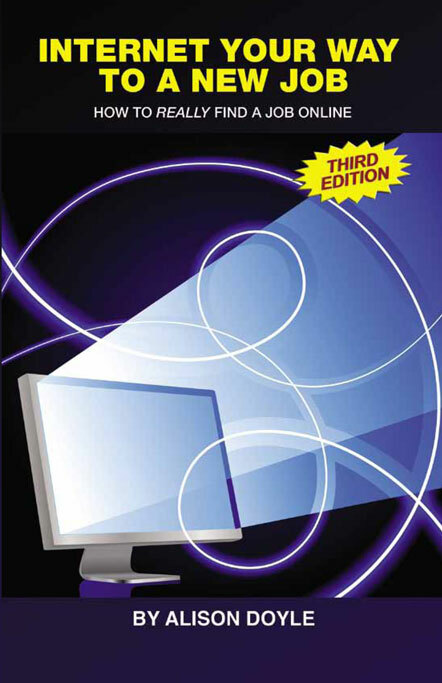 This is the third edition of this popular book. Just a few years ago, you could upload your resume to one of the top jobs sites, click a few times to apply for some jobs, and consider your job search well underway. Today, that isn’t enough. The job market is becoming increasingly competitive. Hiring managers are overwhelmed with applications and are looking at new and different ways to recruit online. Hiring has changed and so has job searching. It’s more complicated than it used to be and job seekers need to be prepared to use all the online job search tools to their advantage. Online job searching often seems like it can be a complicated endeavor. It doesn’t have to be – there are tips and tricks you can use to make the process run smoothly and simply. Alison Doyle will provide you with everything you need to know on how to build your career and find a new job. "This is an important book and a must-read for all job seekers who don't want to be left behind yesterday's hill. About.com job search guide Alison Doyle unwraps the mysteries of Internet job search, the transformative technology that increasingly determines who gets what job. Living in a super-competitive job market, it's now crystal clear that the decade-old strategy of zipping-off-resumes-to-job boards-and-waiting-for-a-call isn't working the way it once did. In 'Internet Your Way to a New Job (3rd Edition)', Alison rounds up and explains in plain words all the new tools (which, like Blackberry resumes, seem to have been invented last week). Her topics range from branding yourself and smarter online networking, to confidential job search and trendspotting (what's likely to be invented next week). Millenial or Boomer, trust Alison to make understanding the new tools easy for you." "It is very timely and refreshing to see Alison Doyle capture the true power of career networking and the urgent priority of developing an online presence to prosper in today's Internet-driven world! Her play-by-play professional brand building techniques and optimization tactics put success within everyone's reach! With more than 64 million active Facebook users today and more than 17 million professional LinkedIn profiles online, it is not surprising that employers are turning to these leading networks as a top recruitment source, and Alison has done a brilliant job of not only identifying these 'must-use' job seeker networks, but she has provided the online tools to take your career to the next level! This is a superb resource and practical guide for every active or passive job seeker!" "Job seekers are competing against thousands of others who are taking full advantage of the speed and efficiency of online job searches. Alison Doyle clearly explains the steps, resources and tools necessary to land a job in todays workplace. This will help anyone looking for a new job!" "Alison Doyle gets it. With the development of new Web 2.0 tools, the rules of job searching have dramatically changed. Internet Your Way to a New Job (3rd Edition) goes beyond just showing you how to hunt for jobs. It shows you how to be the hunted." Rob McGovern, CEO of Jobfox and author of Bring Your A Game. Mike Thomas' "The Daily Machete"
Alison Doyle is a job search and employment expert with many years of experience in human resources, career development, and job searching, with a focus on online job searching, job search technology, social media, and professional networking. Alison has covered job searching for About.com (a New York Times Company) since 1998. She is the author of “Internet Your Way to a New Job” and “The About.com Guide to Job Searching”. More information on Alison’s expertise is available on AlisonDoyle.com.